LE MONDE Institute of Hotel & Tourism Studies has been founded by professionals with years of experience in Hospitality Management and Tourism Education. The Board of LE MONDE Institute consists of people who combine academic qualifications with a long presence in Hospitality Management and Tourism Education. LE MONDE Institute of Hotel & Tourism Studies and the United Nations World Tourism Organization – THEMIS Foundation (U.N.W.T.O-THEMIS Foundation) have established a collaboration since 1999. LE MONDE Institute participates as a member of the U.N.W.T.O’s Education Council since 2001, and has served as its vice president for the years 2003 and 2004. 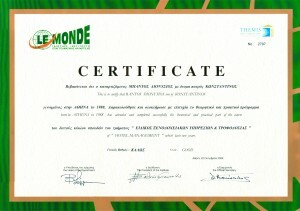 LE MONDE has also been a member of the U.N.W.T.O’s Social Council. Additionally, as a member of the tourism educational programs evaluation committee since 2002, LE MONDE Institute has contributed to the creation and accreditation of tourism educational programs in various countries and has also organized and hosted many GTAT seminars. 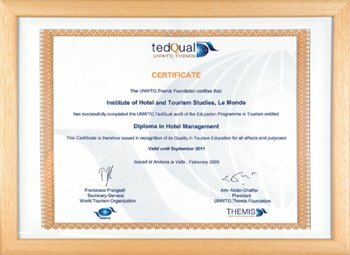 LE MONDE Institute of Hotel & Tourism Studies is the only Institute in Greece with educational programs accredited by the United Nations World Tourism Organization – THEMIS Foundation (U.N.W.T.O-THEMIS Foundation). LE MONDE Institute of Hotel & Tourism Studies is licensed by the Ministry of Education, Lifelong Learning and Religious Affairs. During their studies, students are entitled to student tickets, postponement from military service and other benefits conferred by an Institute accredited by the Government and the Authorities, while graduates are able to participate in certification exams and gain the diploma. LE MONDE Institute of Hotel & Tourism Studies is a member of the Association of Greek Tourist Enterprises (SETE), since 1996. The SETE founded in 1991 to represent the nationwide tourism industry associations and business enterprises operating in the wider tourism economy, covering the entire range of tourism activities. Today is a key to quality upgrading and enhancing the competitiveness of Greek tourism interventions in public debate on tourism, with international presence and action, with continuous research and timely information and emphasis on education and continuous training. LE MONDE Institute of Hotel & Tourism Studies is a member of the Hellenic Association of Travel & Tourism Agencies (HATTA), which was established in 1927. Since then, the Association has been contributing dynamically to the development and promotion of Greek Tourism, providing through its members a variety of differentiated services that have been supporting the country’s developmental efforts while upgrading the quality of the tourist services offered.